It seems that Winter has already arrived and departed here in the Land of Gelatine. An unexpectedly snowy weekend led into a blustery week, but suddenly green grass is revealed again. Is it Spring? Autumn? We're so confused . . . let's call it Summer and take refuge from blistering sun and humidity in a vat of cool, lovely fresh mint. Oh, yes, mint, and a small bit of rum . . . and a squeeze of lime or two . . .okay, perhaps three. 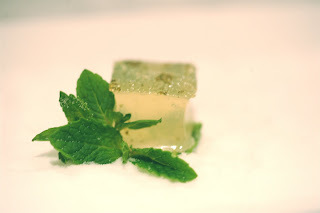 The Mojito Jelly Shot was the star performer of this week's test plates. Refreshing yet bold. Cool yet sassy. Someone pass us another!